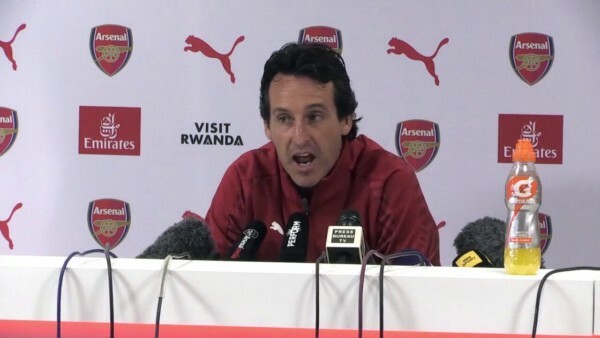 Unai Emery delivered his second press conference of the new season yesterday and I think it’s fair to say it was a mixed bag for us. The positives are that he’s getting to grips with the language more every week and it feels like he should be able to deliver a pretty flawless presser by Christmas at this rate. He looks composed, comfortable and given that some managers – like that Oik managing the team up the Seven Sisters Road – didn’t even speak the local lingo when they arrived in the country, I’m pretty happy that Unai is progressing. Happy because it means his instructions will be understood quicker, that his intentions will be known by the players, that ‘lost in translation’ will become less and less of a ‘thing’ each week. It’s one thing to be able to set up a team with help from interpreters Monday to Friday, but when Saturday comes and perhaps some tinkering is involved, then that requires quicker and more obvious decision making to happen instantly. Sadly Unai wasn’t delivering all good news. Much like his predecessor, the Spaniard seems to have inherited his level of injury-proneness in his squad, as Maitland-Niles is now it for two months with a fracture in his leg. Only at The Arsenal, eh? Only at our club can we be one game into the season and already missing two key players (Ainsley and Kola) for a prolonged spell, not to mention that Koscielny remains sidelined until the new year at least I reckon. It’s hardly ideal, but the positives for the manager are that Nacho is training and despite the fact that Lichtsteiner came on and performed well given the opposition, I’d be much happier with a more naturalised left footed on the pitch against Chelski on Saturday evening. The Swiss right back has already shown how useful he will be this season but Chelski will come at us with pace and high press and I just feel Nacho will be more suited to it. I can also understand the boss’ assertion of keeping Cech in goal at the weekend. Against his former club he’ll want to impress – think Danny Welbeck against United – and I reckon that despite the questions about his ability to play out from the back, it’s the right decision to keep him in. We all know that Cech is not the long term solution but if we’re going to be serious about creating proper competition between the two ‘keepers, then we need both to know that it’s not just ‘one strike and you’re out’ on a game-by-game basis. What seems to be getting lost in all the ‘play out from the back’ malarkey js that Cech made two or three very good saves on Sunday and if he reproduces some of those good saves at the weekend then it might go some way to helping us get a point tomorrow. So I think it makes sense to keep the Czech ‘keeper in sticks tomorrow evening. What was heartening to see in his presser was also the emphasis he is placing on remaining positive. The players have all been snapped this summer looking very happy, laughing, joking, the camaraderie, etc, etc. That’s been good to see as a fan but after defeat at home on the opening day it could all be very easy to turn those smiles in to frowns. So keeping positive is a good thing and hopefully the manager has been able to maintain a high level of morale this pay week. I think he will have. It feels like there was an acceptance from the Arsenal players after the City game, that it was an exceptional circumstance, because City look very good and in terms of the other teams in the league that aren’t us, they are comfortably my preferred choice for the title if we don’t do it. So with that in mind I think it was easier for the players to compartmentalise Sunday’s defeat. Hopefully that means we don’t get an introverted and slightly defensive Arsenal team tomorrow. Chelski are a very good side, but they’re not City, so I do think we’ll get more chances. More of a match preview from me tomorrow though. For now though it’s about focusing on the positives of what Emery has said and the hope that this positivity returns to the players. We will need to have our ‘A game’ tomorrow evening if we’re to even get a point from the match. Let’s hope we bring it. Catch you guys in the AM.